the Byfrexians knew nothing of the nature of their destruction as the hands of Aknaton, Vanth Dreadstar, Juliet, Whis'par, and Za; they were apparently saved from a fate worse than death, although I doubt they would have appreciated that. Powers/Abilities: Byfrexians did not demonstrate any superhuman abilities. They used conventional means to survive their world's frigid climate, although they may have had certain adapations that enhanced their resistance to the cold. They had cities, although much of their world seemed to be frozen tundra. They had an uncertain number of "jumpships," which could escape the planet; whether they could achieve instellar travel is unrevealed. At least as guided by Vanth, they possessed an air force. Vanth specifically equipped equipped the Byfrexian fleet with photonic drives; while unable to match the Zygotean firepower, they could outrun their enemies. Traits: Byfrexian youths were taught of their world's limited technology and conditioned to withstand the rigors of the hostile and frigid planet. (Epic Illustrated#1/7 (fb)) - As part of a plot to prevent the galaxy from succumbing to a slow-death at the Zygoteans' hands, Aknaton traveled to the world that would become known as Byfrexia, an outer planet of Vega, Aknaton left a Sword of Icy Fire, knowing that someday one would come to claim it. (Epic Illustrated#3/3 (fb)) - The young Vanth observed his parents being devoured by a pair of snow bears. Vanth's mind snapped, and he wandered far into the wilds where he eventually took refuge in a holy place known as the Ice Demon's Lantern. (Epic Illustrated#3/3 (fb)) - For years thereafter, Vanth avoided people, but was occasionally spotted roaming the hills, usually naked. One day, Vanth returned to civilization just long enough to outfit himself with enough hunting gear to hold off a small army. Seeking to avenge his parents, he nearly decimated (see comments) the entire region's snow bear population. As snow bears with their main food source, the people "took on a hanging mood"; Vanth stole a jump ship and departed Byfrexia. (Epic Illustrated#3/3 (fb)) - At some point thereafter, the genocidal Zygoteans initiated an assault on Byfrexia, devastating its people. (Epic Illustrated#3/3 (fb)) - Vanth returned, armed with off-world weapons, paranormal strength, his sword, and his "blazing killer rage" and singlehandedly setting the Zygotean invasion back months. (Epic Illustrated#3/3 (fb)) - Vanth's previous actions were swiftly forgiven, and soon after he was appointed supreme commander of all Byfrexian defenses. (Epic Illustrated#2/6 - BTS) - Aknaton told Juliet, Whis'par, and Za -- a trio of agents he recruited in his plot to end the Zygoteans -- he would take them to a mineral poor planet the Zygoteans had already passed (see comments), on which they would await his return. He was going to Vega to gather a man powerful enough to protect them so they could accomplish their goal. (Epic Illustrated#3/3 (fb) - BTS) - Aknaton arrived on Vega (which natives called Byfrexia). (Epic Illustrated#3/3) - On Byfrexia's frigid mountains, Aknaton encountered Lawt who mistook him for a Zygotean. Subduing Lawt, Aknaton learned from him of Vanth, but they were detected by Zygoteans, who sent an A-Team mercenary squad after them. Mystically entrancing Lawt, Aknaton forced him to lead the way and share Vanth's history and abilities, until Lawt was abruptly slain by a blast from Xam of the Zygotean A-Team mercenary squad. Aknaton was stunned by a blow to the back of the head before observing Vanth's arrival on the ledges above. (Epic Illustrated#3/10) - As Vanth picked off a few of the mercenaries, Aknaton slew a few others and then ran for the woods as Vanth took out a pair of Nultorian iron men. When a third Nultorian ambushed and knocked down Aknaton, Vanth slew the Nultorian and then summoned his sword, with which he finished off the rest of the A-Team. The presence of the sword confirmed Vanth was the one he was seeking, and Aknaton introduced himself and revealed he was the sword's creator. Sharing his plans to rid the galaxy of Zygoteans, Aknaton asked Vanth's aid, as neither of them could stop the Zygoteans without the other. There may well be a lot more information on Byfrexia, the Byfrexians, Vanth's parents, etc. in the 70+ stories after the Metamorphosis Odyssey arc in Epic Illustrated#1-9. I'm working my way through everyone as they appear in each issue, so if/when more info becomes available, I'll add it in here. 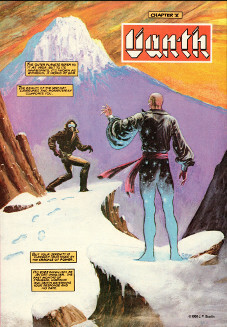 Dreadstar was a licensed character/title created by Jim Starlin starting way back with the Metamorphosis Odyssey in Epic Illustrated#1 in the Spring of 1980. The Metamorphosis Odyssey started around the modern era and affected Earth, but then swiftly destroyed the entire Milky Way galaxy and then moved on like a million years in the future. Dreadstar eventually got his own series under the Epic imprint, but Starlin later took the whole shebang over to First Comics. And in 1994, it was published under the imprint of Bravura, a creator-owned division of Malibu comics. He appeared sometime later in issues #5-7 of the Breed III series. And, there's talk of a Dreadstar television show. Still that earlier Marvel connection allows me to place this reality in the fringes of the Marvel Megaverse. Peter David took over the writing around issue#31 or so, but Starlin remained the owner. At any rate, from start to finish, it is the best series I've ever read, period! I'd love to see it continued, by Starlin, David, or both! (Epic Illustrated#3/3 (fb)) - After the young Vanth observed his parents being devoured by a pair of snow bears, Vanth's mind snapped, and he wandered far into the wilds where he eventually took refuge in a holy place known as the Ice Demon's Lantern. (Epic Illustrated#3/3 (fb) - BTS) - Therein Vanth apparently at some point found the Sword of Icy Fire, which granted him great power. All the people of Byfrexia knew is that he had some sort of incredible experience. The son of Nimsu, Lawt was one of the resistance fighters against the Zygoteans. (Epic Illustrated#3/3) - On Byfrexia, Aknaton appeared before the native Lawt (son of Nimsu; one of the resistance fighters against the Zygoteans) in the frigid mountains; mistaken for a Zygotean, Aknaton formed a shield to deflect Lawt's blaster fire and then stunned Lawt with an energy bolt. 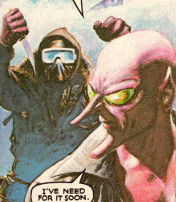 Though his non-lethal force convinced Lawt he was not Zygotean, and Lawt recognized the man Aknaton was seeking as Vanth, Lawt nonetheless refused to take Aknaton to Vanth, fearing he was too powerful to trust; meanwhile, the pair was detected by the Zygoteans, who sent an A-Team mercenary squad after them. Aknaton then mystically entranced Lawt, forcing him to lead the way and share Vanth's history and abilities, until Lawt was abruptly slain by a blast from Xam of the Zygotean A-Team mercenary squad. Nothing else is known about him. Immense bears dwelling in the frozen tundra, they were carnivorous and very willing to feed on the Byfrexians humanoids. Additionally, they served as the main source to the Snow Bears. As was the standard, they taught their young son, Vanth, of his world's limited technology and conditioned to withstand the rigors of the hostile and frigid planet. They were eventually devoured by a pair of snow bears, and Vanth was traumatized by witnessing this from a distance. A base constructed by the Zygoteans invading Byfrexia.